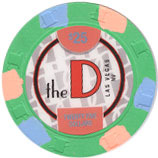 THE LATER) UNLESS STATED OTHERWISE. 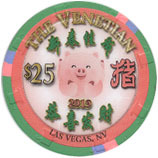 THE 2019 CHIP RACK 19th EDITION IS AVAILABLE FOR IMMEDIATE SHIPPING CLICK HERE!!! 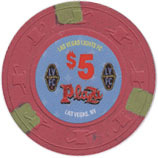 Plaza released a new $5 house chip. 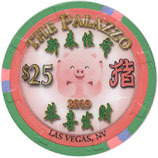 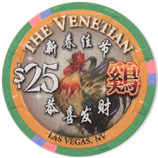 Cosmopolitan, Palazzo, Venetian, Palace Station (2) & Rampart all released Chinese New Year chip. 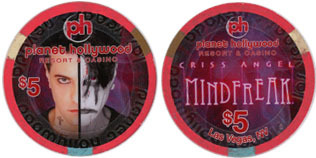 Westgate released a $25 Barry Manilow chip, New York New York released a $25 Vegas Golden Knights chip and Planet Hollywood released $5 & $25 Criss Angel chips. 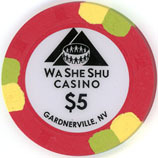 All chips are available for immediate shipping. 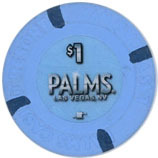 Palms released a new darker $1 chip. 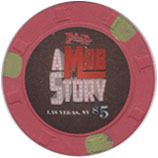 Plaza has a new $5 Mob Story house chip. 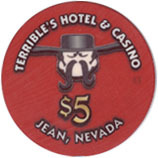 The newly opened Terrible's, Jean and Wa She Shu, Gardnerville casinos have new racks. 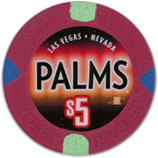 These chips are available for immediate shipping. 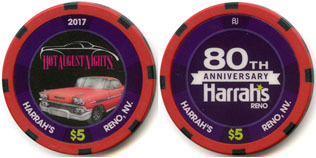 RENO HOT AUGUST NIGHTS, HARRAHS RENO & TAHOE YEAR OF THE DOG, WESTERN VILLAGE HOUSE CHIPS. 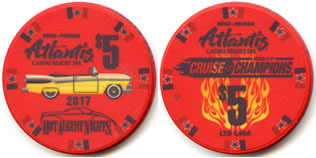 Atlantis & Peppermill released Hot August Nights chips. 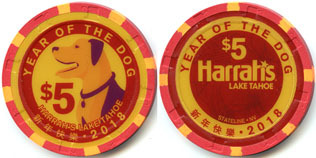 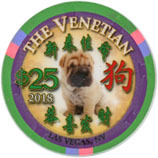 A few Harrahs Reno & Tahoe Year of the Dog chips were finally released. 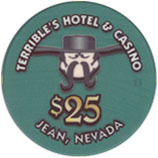 The Tahoe are virtually impossible to obtain (now sold out). 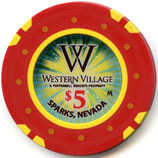 Western Village released a new $5 house chip. 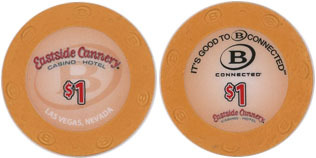 These chips are available for immediate shipping. 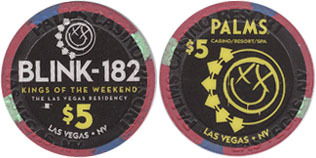 The Palms released a pair of Blink-182 chips. 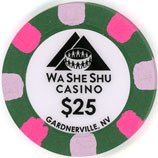 These were very hard to find and I only have a few pairs left. 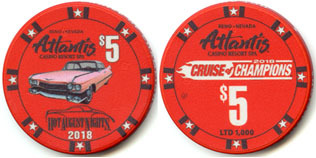 These chips are available for immediate shipping. 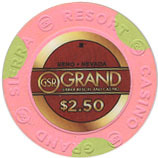 GRAND SIERRA RENO, RIO WSOP & SOUTH POINT CHIPS. 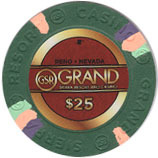 The Grand Sierra Reno has new rack chips. 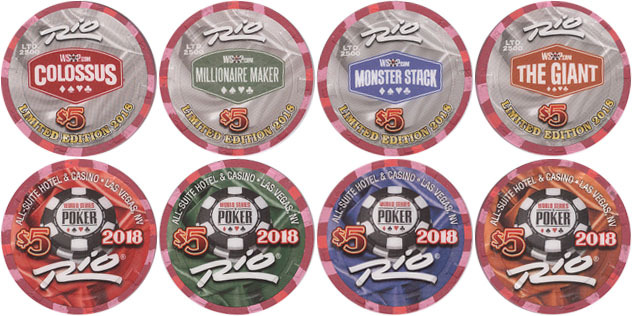 The Rio released a set of 4 $5 WSOP chips. 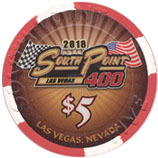 South Point released a $5 Las Vegas 400 chip These chips are available for immediate shipping. 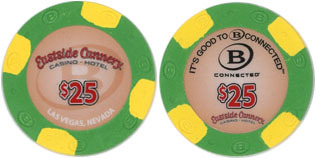 PARK MGM & ELLIS ISLAND CHIPS. 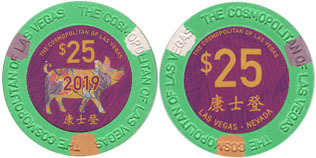 The Park MGM (formerly Monte Carlo) have released their first rack chips. 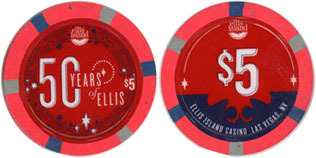 Ellis Island released a $5 50th Anniversary chip. 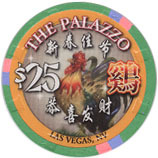 These chips shipped on May 29. 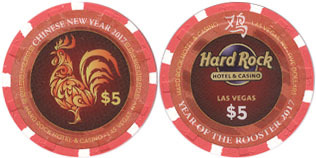 Hard Rock released a $5 chip. 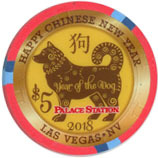 Palace Station released a pair of $5 chips. 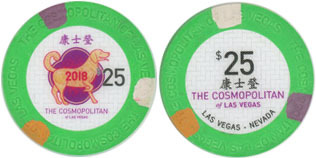 Cosmopolitan, Palazzo & Venetian released $25 chips. 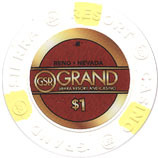 These chips shipped on March 10. 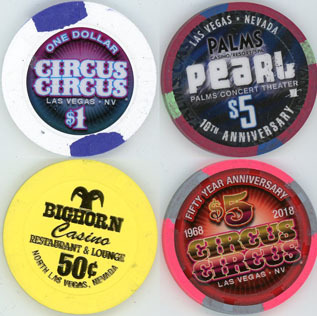 BIGHORN, CIRCUS CIRCUS & PALMS CHIPS. 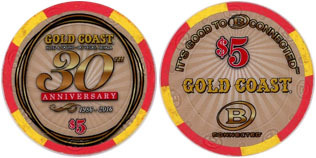 Bighorn have released a 50c chip (very limited and hard to obtain), Circus Circus have released a new $1 house chip an a $5 50th anniversary chip. 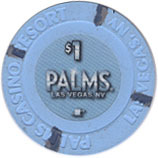 Palms have released a $5 Pearl 10th anniversary chip. 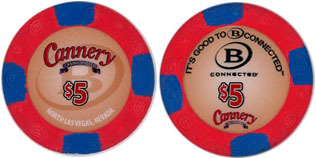 These chips shipped on 8th February. 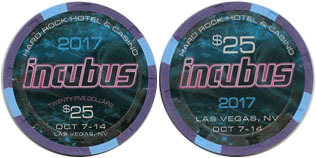 Hard Rock have released $5 & $25 Incubus chips. 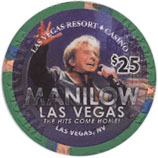 These will ship approx 15th October. 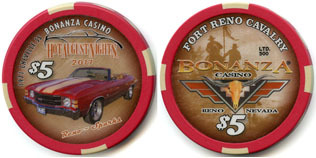 CIRCUS CIRCUS 50th ANNIVERSARY & RENO HOT AUGUST NIGHTS CHIPS. 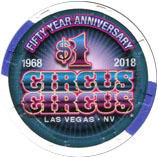 Circus Circus have released a $1 50th anniversary chip. 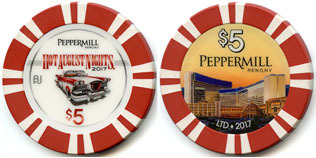 Atlantis, Bonanza, Harrahs & Peppermill have released Hot August Nights chips. 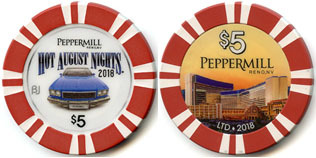 These shipped on 3 October. 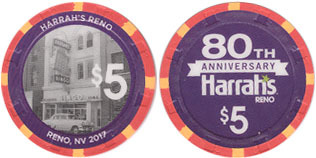 SILVER LEGACY DROP CHIP, HARRAHS RENO & SILVERTON NEW COMMEMORATIVE CHIPS. 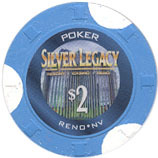 Silver Legacy have released a new $2 poker/drop chip. 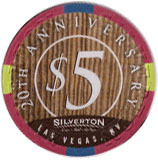 Harrahs Reno have released a $5 80th Anniversary chip and Silverton have released a $5 20th Anniversary chip. 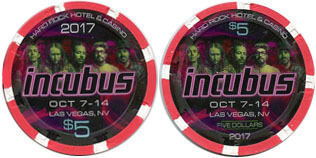 These shipped on 11th August. 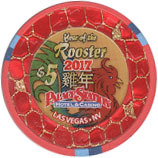 RIO WSOP 2017 & WESTGATE LAS VEGAS NEW COMMEMORATIVE CHIPS. 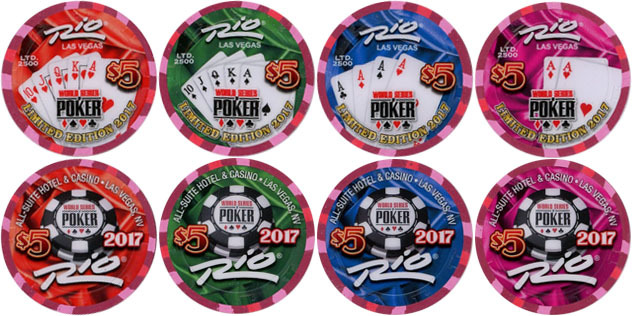 Rio have released a set of 4 2017 WSOP chips. 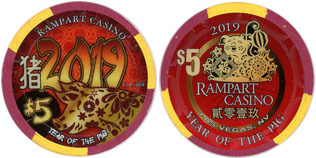 Westgate Las Vegas have released a $5 Jennifer Romas Sexxy chip. 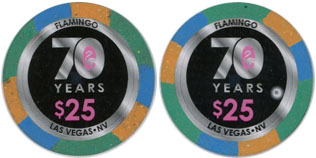 These shipped on 30th June. 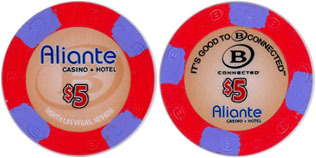 WESTGATE LAS VEGAS NEW COMMEMORATIVE CHIP. 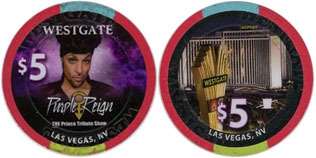 Westgate Las Vegas have released a $5 Prince chip. 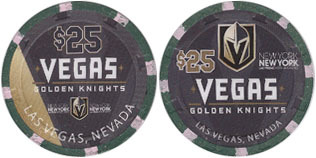 These shipped 20th May. 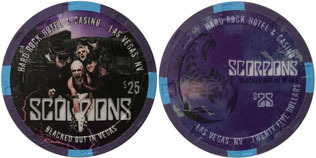 HARD ROCK LAS VEGAS & ORLEANS NEW COMMEMORATIVE CHIPS. 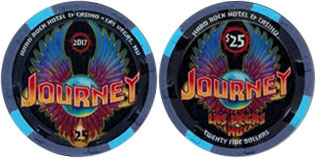 Hard Rock Las Vegas have released $5 & $25 Journey chips for their 2017 residency. 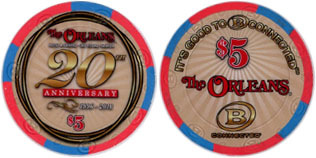 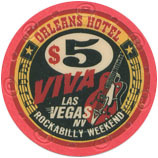 Orleans have released $5 Rockabilly chips. 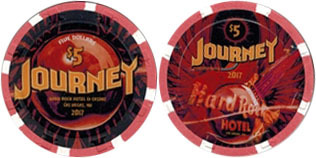 The Hard Rock chips shipped on 8 May. 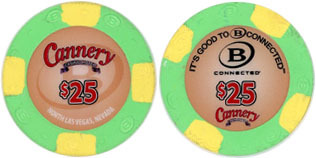 Orleans chips shipped on 20 May. 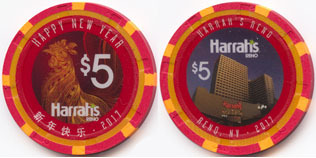 HARRAHS RENO & LAKE TAHOE CHINESE NEW YEAR & SANDS REGENCY HOUSE CHIPS. 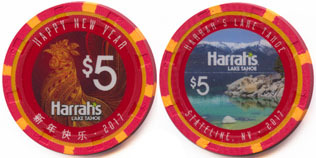 Harrah's Reno & Lake Tahoe have both released $5 Chinese New Year chips. 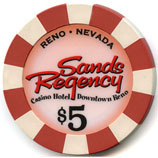 Sands Regency have released a new $5 house chip. 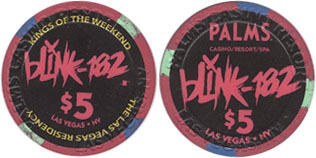 These shipped 10th March. 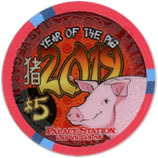 THE D NEW RACK CHIPS, HARD ROCK, WYNN, PALACE STATION, LUCKY DRAGON, VENETIAN & PALAZZO CHINESE NEW YEAR CHIPS. 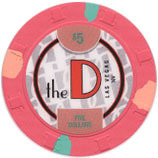 The D have released new rack chips. 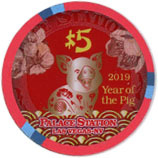 Hard Rock, Wynn, Palace Station, Lucky Dragon, Venetian & Palazzo have all released Chinese New Year chips. 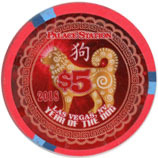 The Palace Station are very hard to obtain and limited to one per customer. 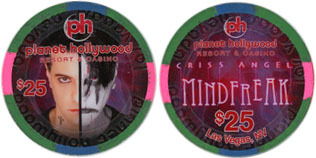 These are all available for immediate shipping. 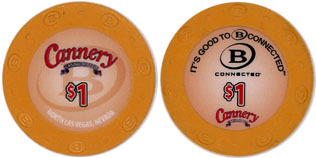 CANNERY NEW RACK CHIPS, GOLD COAST, ORLEANS, FLAMINGO & GREEN VALLEY RANCH COMMEMORATIVES. 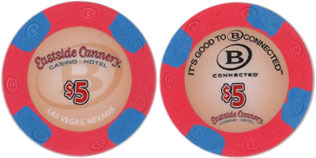 Cannery & Eastside Cannery have released new rack chips following their takeover by Boyd Group. 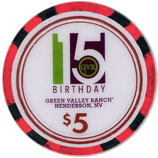 Gold Coast, Orleans, Flamingo and Green Valley Ranch have all released various anniversary chips. 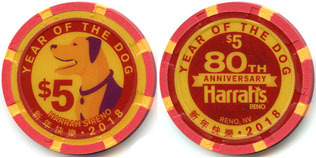 These all shipped on 19th January. 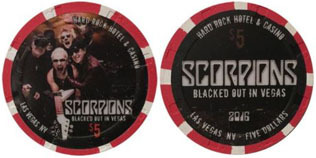 The Hard Rock, Las Vegas released $5 & $25 Scorpion chips. 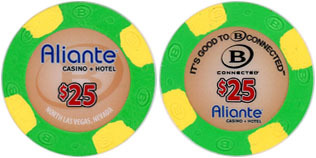 These shipped on 21st December. 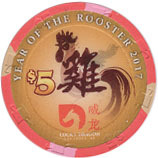 LUCKY DRAGON CASINO LAS VEGAS RACK CHIPS. 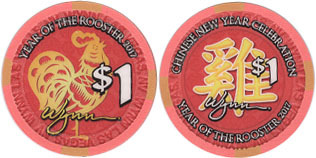 The Lucky Dragon Casino, Las Vegas opened on November 19th and has rack chips. 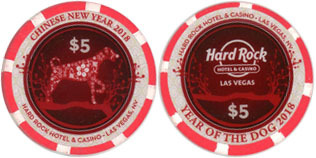 These shipped on 2nd December. 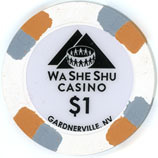 NOTE the casino permanently closed after just a short time running. 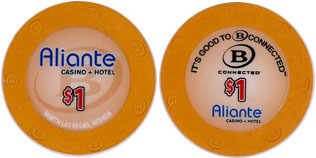 Following its acquisition by Boyd Group, Aliante has released new rack chips. 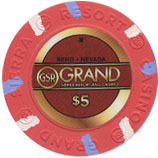 These will all ship approx 7th November. 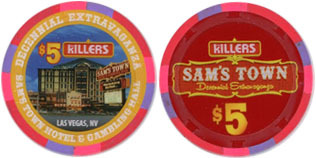 PALMS NEW RACK CHIPS, PLAZA, LUXOR & SAMS TOWN COMMEMORATIVES. 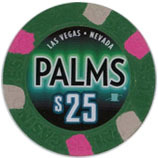 Following its acquisition by Stations Casinos, the Palms has released new rack chips. 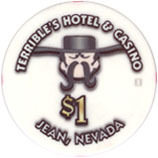 The $1 was in fact released some time ago but only a few had been put into play previously. 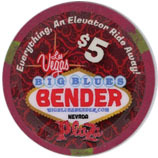 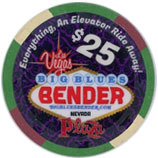 The Plaza have released $5 & $25 Big Blues Bender chips. 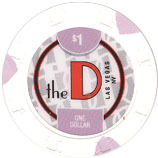 Both denoms are in short supply. 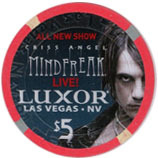 Luxor have released a new $5 Mindfreak chip and Sams Town have released a $5 Killers chip. 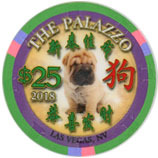 These will all ship approx 23rd October.